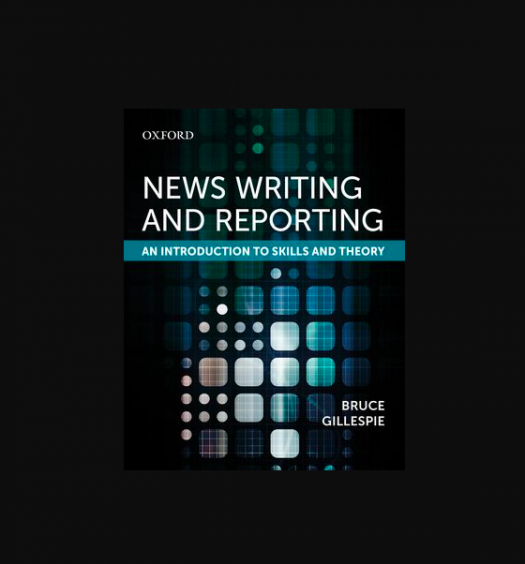 Bruce Gillespie's book News Writing and Reporting: An introduction to skills and theory. Image courtesy of Oxford University Press. Bruce Gillespie. News Writing and Reporting: An Introduction to Skills and Theory. (Oxford University Press, 2018). Paperback, $69.95. ISBN – 9780199021154. Bruce Gillespie begins his textbook with a story. Gillespie writes about how he came to journalism as an “unlikely” journalism student. Coming from a small town in Ontario to journalism school in Ottawa, he felt that he lacked the apparent in-depth knowledge of the profession he felt his big-city classmates possessed. He had worked at his small town newspaper (starting as a typesetter), and he knew he liked to write, so he wanted to give studying journalism a go. That narrative informs the structure and the content of his excellent textbook, News Writing and Reporting: An Introduction to Skills and Theory. “It is a book to get you started,” is how Gillespie, now the program coordinator of the digital media and journalism program at Wilfrid Laurier University, describes his text. Introduction to journalism textbooks can be challenging for both authors and for students. There is a tendency to try to pack too much into the book, to go broad with the subject material. Gillespie’s aim is admirably narrow. The pace of the book is slow and workmanlike — and that’s a good thing. There are no lessons on writing op-eds, feature stories, or anecdotal ledes. There is no overview on using social media or multimedia storytelling. This book is focused on the basics of journalism, and that is its strength. The lessons move in a logical order. Before he even talks about writing, Gillespie defines the seven skills a journalist should have: good writing; curiosity; ability to work quickly; the ability to explain complex ideas clearly; the ability to talk to people; being committed to research and accuracy; and to enjoy being busy. Then, it’s a lesson in the nuts-and-bolts of journalism, starting with basic writing — using active verbs, simple word choice, etc. — and moving through the reporting process, from story selection to research and interviewing. Gillespie does so in a way that is easy to follow, easy to read and fits his audience. His target audience seems to be a student like he was, someone who is interested in journalism but is not immersed in it. Gillespie never assumes his readers know the world they are entering. He takes the time to point out that journalists call their work “stories” instead of “articles.” That’s something we in the business take for granted but may confuse someone who is new to the field. This generous attitude suffuses the book. That ability to break down the established practices of journalism and explain them plainly is Gillespie’s strength. One of the best and most useful parts of the book is a sample email requesting an interview. This is the type of lesson so many journalism textbooks (and professors) would overlook. But for students, this is something they’ve probably never done before and it’s not a skill that comes naturally. This is a vital lesson, and Gillespie walks though the process in a very helpful way. From the skills sections, all of which feature valuable exercises (the only complaint about them is that there could be more of them), to the guest readings at the end in which journalism professors and professionals introduce readers to some of the theoretical issues in our industry (including a wonderful piece by Duncan McCue about reporting on Indigenous populations), Gillespie’s book is incredibly student-centric. If a student is considering a career or a major in journalism, this book will teach them what they need to know about the profession and how to do it well. Disclosure: Bruce Gillespie is a former editor-in-chief of J-Source. Dr. Brian Moritz, Ph.D., is an assistant professor of digital media production and online journalism at SUNY Oswego and the author of Sports Media Guy.